Ford Mustang Active Performance Exhaust Audio Engineering | Randy Wise Ford Inc. The Ford Mustang GT is a top sports car, rated highest in the class by US News & World Report. The latest design and performance options are incredible with the Mustang GT's redesign. The all new engine and transmission allows you to fully customize your driving experience. There are five new performance settings as well, including the drag strip mode. This high-speed option allows you to get the most performance from your car with an effortless press of a button. There are also ways to change your exhaust too. Have you ever wanted to start up your car with a quieter engine? You can now do so with the Active Valve Performance Exhaust system. This lets you change your settings from quiet to track mode. With quiet start, you can schedule your vehicle to always start in a whisper quiet mode. 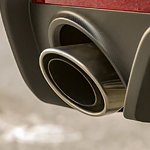 You can check out all of the options and audio engineering for the exhaust when you test drive at Randy Wise Ford Inc. located in Ortonville.